You are here: Home / Bread & Nibbles / Bread / Sun-dried tomato bread with oregano and sea salt crust. Over the last few weeks, I have been experimenting with different bread recipes. I have been combining different types of flour, different seed combinations, finding interesting ways to flavour the crust.. it has been a lot of fun. Last week, I made a Paul Hollywood inspired sun dried tomato and black olive bread (I intend to get this published on Love the kitchen in due course), today I wanted to focus on just tomato. Not only did I want to work on texture, I was also very keen adapt the colour. This was destined to be a tomato-flavoured bread, it was fitting to to try and get a natural colour to the dough, without the use of artificial food colouring. Knowing how well tomato goes with oregano in many pizza recipes, I decided to sprinkle a small amount on the crust as a finishing touch. The end result is a far from snappy titled Sun-dried tomato bread with oregano and sea salt crust. If interested, sun-dried tomatoes (as the name implies) are tomatoes which have lost most of their water content due to being dried in the sun. You need very few for this recipe, and if concerned by the price, consider that it takes between 8 – 14 kilos to make just 1 kilo in its dried form. I buy them dry-packed – you may also find this in oil, and other ingredients and herbs may be added. Sun dried tomato bread with an oregano and sea salt crust. Combine all the dry ingredients (flour, yeast, salt, dried oregano and sugar)in a large mixing bowl, and mix thoroughly using a bell whisk. Personally, I find this works far more effectively than using a spoon. Measure out 3 tbsp tomato purée/ sun-dried tomato paste into a measuring jug, then add hot (from the tap) water to the 275ml line. Mix well using a mini-whisk. Next, add 3 tbsp of olive oil to the mixture and stir thoroughly. It may not look too appealing, but this has no bearing on the final outcome. Next, create a well in the middle of the mixture and slowly pour about one-third of the liquid. Using a silicone spatula or wooden spoon, start to fold the dry ingredients into the liquid. Then, gradually add the liquid, and keep folding together until a dough ball is formed. The colour will change to a light terracotta/salmon colour due to the tomato purée. Remove the dough from the mixing bowl, and knead for 5 minutes or so until the texture is no longer sticky, yet still elastic. You may need to sprinkle additional flour during this process, so keep some at hand. Oil the same mixing bowl (saves washing up) with a small amount of olive oil, then return kneaded dough ball, cover with a tea towel or cling film for 1 hour, and allow to rise. The dough should have doubled in size (maybe a little more). Remove the dough and flatten. Then, start to sprinkle the thin slices of sun-dried tomatoes (I try to keep as much space between the sliced for a more even distribution in the loaf itself). Fold the dough towards the middle, flatten again, then keep repeating until all the sun-dried tomatoes have been used up. Knead the dough ball for a couple of minutes, then mould into an oval shape and place on a baking tray. (Tip: I use a silicone non-stick baking sheet to line a baking tray and have been very happy with with the results). Cover again with a tea towel, and allow to rise prove for a further hour. Preheat the oven to 200C. Optionally, and to maintain a softer crust, pour 2 x cups of water into a tall-sided baking tray and put this in the bottom of the oven. As the oven heats up, as will the water. The purpose is to create a gentle steam, which in turn will result in a softer crust. Uncover the loaf, and score the top using a sharp blade into diagonal lines, about 2-3cm apart. Gently brush or spray olive oil over the top. Then, sprinkle on top a combination of sea salt (my favourite is Gros Sel de Guérande) - a natural coarse grey sea salt) dried oregano, and gently press them into the top of the dough with the palm of your hand. Bake in the oven for 30 mins. Once cooked, tun onto a wire rack and allow to cool. If you want to maintain an even softer crust, cover with a tea towel whilst the loaf cools down. Enjoy. Great on its own, or why not try with home-made Chickpea hummus? I love of good bread. A great recipe, and it has to be the best bread that I’ve made to date! Thanks for sharing this awesome recipe. 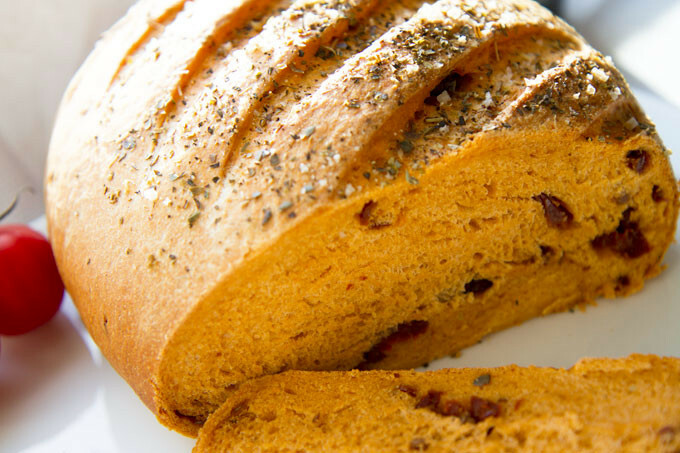 Really easy to make and very tasty loaf!!!!! Thanks for the positive feedback, and feel free to share with any friends. I’d at least halve the salt content when mixing dry ingredients, as my loaf seemed to take salt from the tomatoes and came out a bit on the Dead Sea Scrolls side . . . . . that said, the recipe worked brilliantly to make a big, light, well-flavoured loaf. Great. I am glad the recipe worked our well for you. thank you for your comment and very sorry to hear that it did not work out for you. Will all my recipes, I will have made them two or three times prior to publishing. Sadly, ovens do vary quite significantly. I have a NEFF electric fan assisted oven which is very good at sustaining a consistent temperature. I must have baked 50 + loaves without fail. However, about three months ago I made a loaf in a friend’s oven – one they hardly use- and I ended up having to cook for an additional 20 mins. the temperature was set at exactly the same as mine, also had a fan, but really did not bake at all well. I love this! It rose really well and had a beautiful orangey colour and great crust (I didn’t steam it). It did need a bit more than half an hour since mine was a little dense but I think my oven is to blame for that. Thanks for posting! Hi Collete – I am so glad it worked out for you. Thanks too for mentioning that the longer time was required – I will certainly need to edit the baking time and take into account that all ovens do vary. The best bread I have ever made my family can’t get enough of it, can I add olives or other ingredients to this recipe thanks Kay. Hi Kay, I am delighted to hear that my bread recipe has become a firm family favourite. It is comments such as yours which makes my contribution to Love the kitchen all the more meaningful. Regarding adding olives.. absolutely… however I would recommend slicing and drying first with kitchen towel. Let me know how you get on, and I’d love to see any pictures of what you have made. Added more sundried tomatoes but very good recipe overall. Also added some of my homegrown tomato passata which gave it a special taste. Also used 350g unbleached and 150g wholemeal bread flours to make the dough a little stronger. Turned out super delicious, thanks for sharing. Beautiful texture and crumb. Especially good as accompaniment for soups. Hello there. thank you for your kind words and delighted to see how you have adapted this. I am sure the homegrown tomato passata makes all the difference. Next time you make this recipe, I’d love to see a photo and put it on my blog. all best. Richard.